Many verbs in English are often followed by the same preposition. Therefore it is best to learn them togehter from the beginning. However, even if you do this it is neccessary to sum it up from time to time. The following summary was created for my elementary students of English and it contains the verbs they know which are often followed by the prepositions FOR, ABOUT, AT and TO. In this post you can find a mind map and two games to practise the usage of the given preposition. 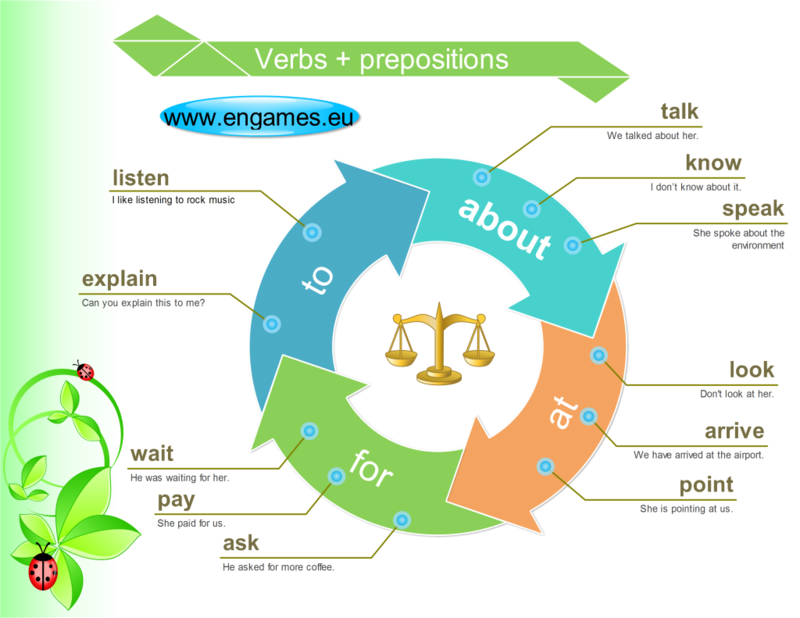 The following mind map graphically shows the verbs which are used with the prepositions FOR, ABOUT, TO and AT. Once you memorise all the verbs and prepositions that follow them you can try the following games. In the first game you should complete the sentences with the correct preposition. If you succeed you can play the game Highway Race. In this game you try to avoid all the cars on the highway. The best result has been 50,000 points. Can you do better? The second game is a classic. It is called Teacher Invaders and your task is to shoot all the invaders before they destroy the whole planet. However, from time to time the game is interrupted and you have to complete a sentence with the correct preposition. Good luck. If you liked this post and you feel that you need to practise the prepositions more you might like the following posts on our site. Do you think that we should create some more posts? Please leave a comment and we might do it. i want receive more about verb and prepositons exercise by email? improve my grammar.